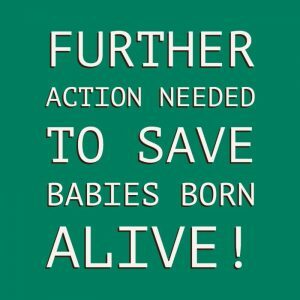 Respect Life Office | Diocese of Rockville Centre » Action Alert: Further Action Needed to Save Babies Born Alive! Thank you to all who urged your U.S. representative to sign the discharge petition to force a vote on the Born-Alive Abortion Survivors Protection Act. The good news is that 199 House Members have signed the petition. But we still need 19 more to sign it to force a vote on this life-saving legislation. MANY people are upset with the idea of babies being left alone to die after surviving an attempted abortion. If we make enough noise, this bill has a chance of being voted on in the House, and eventually becoming law. Send a message today urging your representative to support the Born-Alive Abortion Survivors Protection Act by signing the discharge petition and voting to pass the bill. Click here to send your message by email. Share this alert widely! Paste this link into an email, and share our posts on Twitter or Facebook or make your own with the graphics included in this email to get the word out. Thank you for all you do to promote and defend the sacredness of human life!